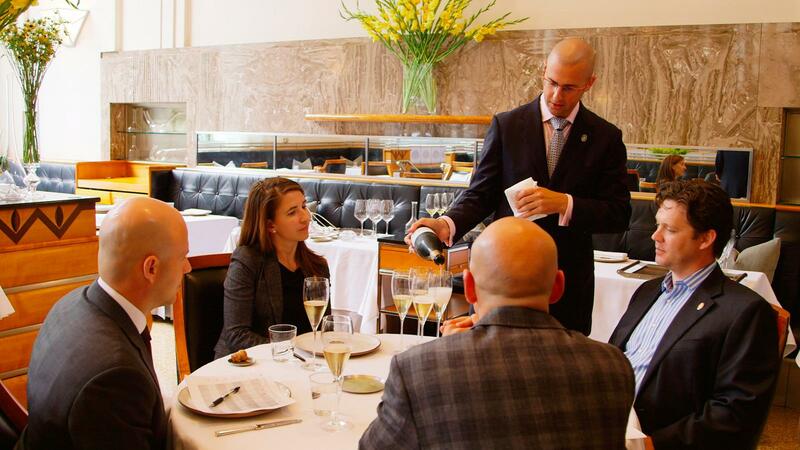 MS candidate Josh Nadel (standing) attempts to serve equal pours to Master Sommeliers Dustin Wilson, Laura Maniec, Geoff Kruth and Sabato Sagaria. Yannick Benjamin is a New York sommelier who works from a wheelchair, the result of a car accident a decade ago. (He is also cofounder of the Wheeling Forward charity.) As he serves his father a bottle of Bordeaux, he recounts his parents' love of wine. The emotional story strikes a chord, as we recall our own journeys on the path of wine. It's a rare moment of empathy in the new TV series Uncorked, premiering tonight, Nov. 10, on the Esquire Network. The new hour-long program, with six episodes on tap for season 1, is an offshoot of Somm, the movie directed by Jason Wise, who returns here as co-executive producer. In my opinion, Somm was a dud. The movie claimed to take us inside the high-drama world of the secretive Court of Master Sommeliers. Instead it showed us a dysfunctional group of overly competitive young men who seethed with testosterone-fueled, ego-singed anxiety, sucking the joy out of wine. Benjamin's impetus for becoming a sommelier is genuine, and so we see a kinder, gentler side of the profession than we did in the movie. It's intriguing to see his honesty wind up hurting him. During a practice exam that dominates much of the first episode, he tells the group of faux diners (a group of four Master Sommeliers whose purpose is to trip up the candidates during their trials) that he never actually eats cheese. This harpoons their request for wine with their cheese course, and they seethe at his failure to seize the moment to pad the check with another bottle. In addition, this new group seems genuinely friendly with each other. There's still competition, but also plenty of support. During their practice blind tastings, there's none of the aggressive jockeying we saw in the movie, but instead playful banter interspersed with congratulatory acknowledgments. And the narrative is broken up occasionally with quick outtakes such as "What's the best party wine?" or "Are screwcaps inferior?" that personalize the characters and add a touch of education that the movie sorely lacked. Despite the softer approach, though, much remains the same, resulting in Uncorked being only modestly entertaining. This time it's a group of six budding sommeliers instead of four. Despite the expansion, only one female character joins the fray (Jane Lopes of Wine Spectator Grand Award–winning Eleven Madison Park), failing to represent the gender diversity common among young sommeliers today and continuing a major failing of the movie. We are introduced to this group of hard-working sommeliers (is there any other kind?) but save for Benjamin's "Proust's madeleine" moment, we never find out what drew them to wine or why they feel passing this exam is important, when they are already doing the job they supposedly love. All we see is that in whatever free time they have, even eschewing sleep along the way, they hit the books hard. Lopes has three-ring binders stuffed with her own hand-drawn maps and notes. It's an impressive effort, but again, why? Where does this fire come from? Instead of drawing us in with backstory, the show regurgitates the movie's penchant for showing us sweaty foreheads and nervous hands spilling wine during decanting (which the MSes pounce on gleefully). Uncorked employs the standard reality TV formula by throwing the characters into a situation we know they can't all survive. We're left waiting to see who has a meltdown, just like The Bachelorette. After the trial by fire, the episode's faux service exam winner gets a 5-day trip to Provence, but everyone gets to stay on the program. So you'll have to wait for the season finale to see who actually passes the real exam (or you can just peruse the list of 2015 inductees at the Court of Master Sommeliers' website). In the end, the most telling moment is when Morgan Harris (of Best of Award of Excellence–winning Aureole) heads out to dinner with another contestant, Dana Gaiser (who works for an importer and isn't even a sommelier). They order Riesling with their pork terrine, prompting two young women at the table next to them to ask why. Harris launches into a soliloquy that starts with "Why does anyone do anything?" turning the women off faster than an American hairdryer blowing a fuse in a French hotel. And as the somm torches this teachable moment, I, in turn, am turning off the television. In regards to the cheese while I appreciated Benjamin's honesty, I think the big reason the judges got on him was because a Master Sommelier should be familiar enough with the flavors and components of various foods whether you eat them or not...similar to Martha's Vineyard having a minty or eucalyptus like flavor. I've never had it but I know that from reading (every Martha's Vineyard tasting note written by JL on this website says bay leaf or mint). That being said I enjoyed the show and enjoy reading your articles (but I am as they say a 'cork dork').